Iceland is a magnificent land full of natural beauty and wonder. The island is quickly becoming a popular destination for those seeking to explore scenery that can only be described as “other-worldly”. Along the southern coastline of Iceland are many inspirational views that will take your breath away. They will give you a true sense of the word “awesome”. South Iceland will captivate your heart and dazzle you with its pristine natural beauty. A photographer’s delight, be sure to have your camera ready to shoot at a moment’s notice. Every corner you round in south Iceland has something new for you to experience. Every moment is worthy of a framed picture. No matter which season you visit the island of Ice and Fire, the scenery is fantastic and breath-taking. Lush green valleys, snow covered glaciers, ice choked lagoons and black sandy beaches. South Iceland is bursting at the seams with photographic glory. The smaller farming villages and towns of south Iceland allow a great escape from populated cities. 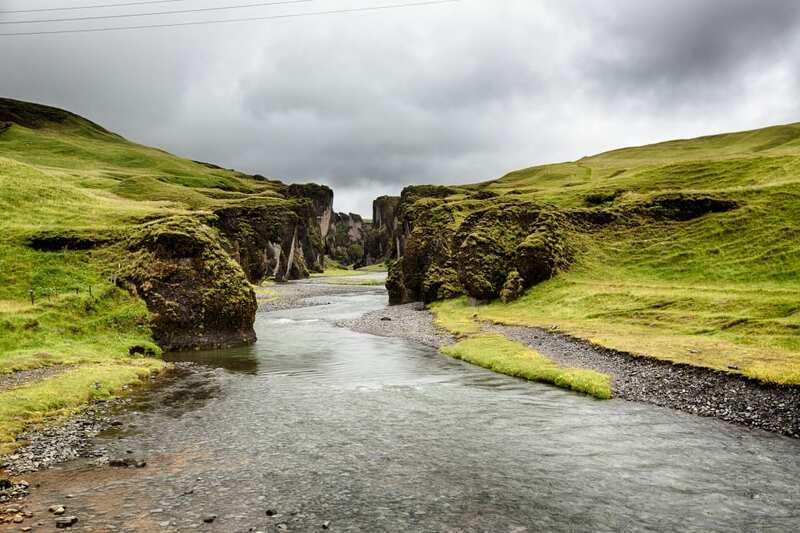 This short drive from Reykjavík along the Ring Road transports you to another world. A rugged and gorgeous world full of scenic hiking, inspirational waterfalls and dark beaches. 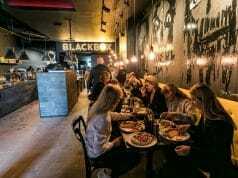 The South Coast of Iceland is far more than just another tourist destination. Whether visiting for the Northern Lights, or the scenic beauty, or the solitude, the South Coast will fulfill your wishes. Come take a look at twelve of the most incredible experiences South Iceland has to offer. Welcome to the start of a journey that you are sure to never forget. This impressive canyon is the result of retreating glaciers from the last ice age, combined with the glacial melt-waters eroding away the ancient volcanic flows. The thick green moss in the summer and snow-laden cliffs in the winter make this South Iceland location a perfect spot for both hikers and photographers alike. The trek up the eastern bluff to the observation deck at the top is just over a mile long. It provides an amazing view of the canyon and the waterfall on the western wall. The constant change in the canyon’s direction gives viewers the opportunity to capture its elegance from all angles. During the winter months, when the river is at its lowest point, you can take the journey upriver along the canyon floor. You will be staring upward at the looming walls stretching hundreds of feet into the sky. As with all natural sites, take care to observe any ropes or caution signs along the way. They are there for your protection as well as for the fragile ecosystem. Vandalism and tourist disregard has threatened some of South Iceland’s most beautiful locations. For more on this, please visit our post Deep Inside Fjadrargljufur Canyon. 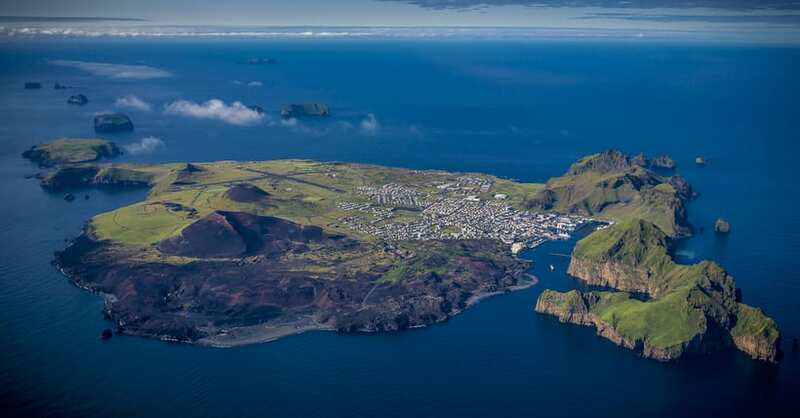 Just a short ferry ride off the coast of South Iceland is the volcanic archipelago of Vestmannaeyjar, the islands of the westmen. These islands are relatively new in geologic terms. Created within the last twelve thousand years, the island chain remains volcanically active right up into our modern day. In 1963, an eruption gave birth to a new island, Surtsey. This is now a research station and is officially Iceland’s southernmost point. The eruption of Eldfell in 1973 added just under a square mile to the largest and only populated island of Heimaey. The fascinating history of the eruption and the island’s resiliency is captured at the Eldheimar Museum. This includes the colossal and ultimately successful attempt at redirecting the lava flows from closing off the island’s only harbor. While out on the hiking trails or walking the historic areas, you may come across some of the local wildlife. South Iceland, and in particular Vestmannaeyjar, is home to the world’s largest colony of Atlantic Puffins. With over a million nests, you will undoubtedly get a glimpse of this iconic bird. Directly behind one of south Iceland’s inviting villages is the sloping falls of Systrafoss. These twin streams slip and slide their way down the mountain from lake Systravatn. Taking its name from the sisters of the Kirkjubæjar Abbey, the twin falls of Systrafoss are surrounded in morality tales. Legend tells of two nuns, both fallen in favor and condemned, were buried above the falls. One of the nuns was said to have been in league with the devil. The other simply spoke ill of her superiors. After they were buried, one was exonerated, and her burial mound is covered with grass and beautiful flowers. The other remains barren to this day. Folk tales are common among the people of Iceland and the story of the two sisters enhances the viewing of this sloping waterfall. Depending on the time of year and the recent rains this waterfall can be light and in dryer seasons can even come to a stop making your sighting of them even more special. 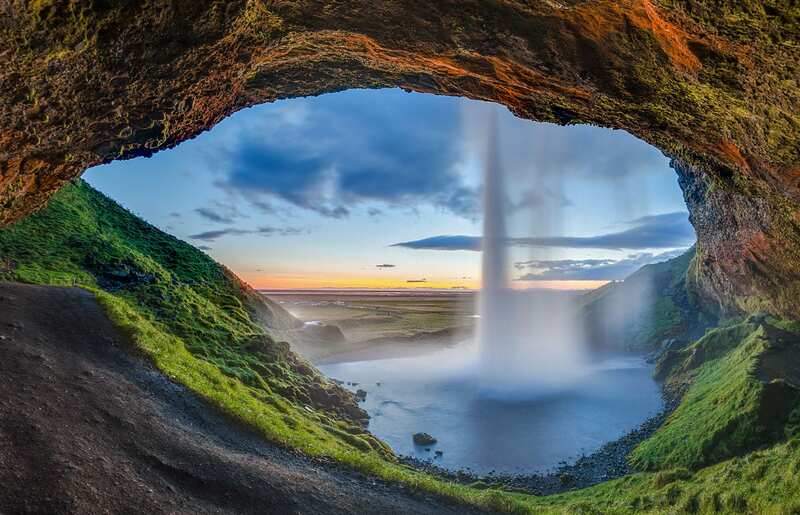 Possibly the most photographed of South Iceland’s many glacial waterfalls is the majestic Seljalandsfoss. 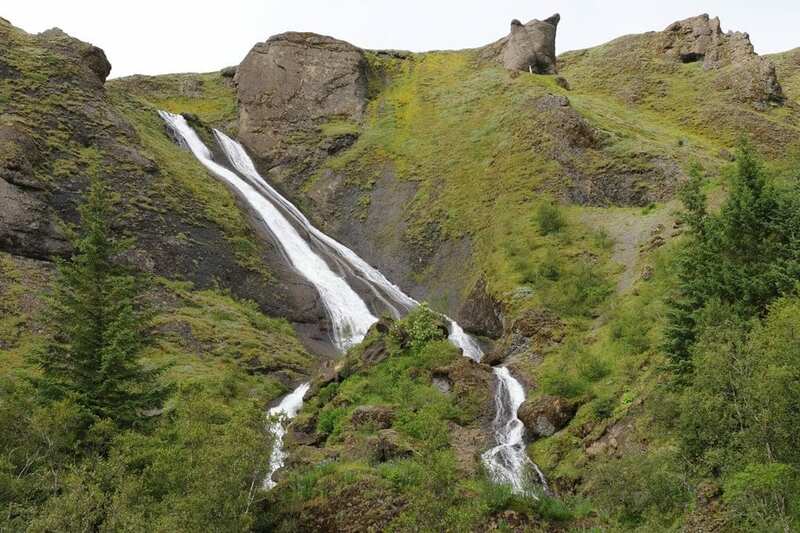 Visible from the ring road, this nearly 200’ waterfall is a popular stop for all visitors to south Iceland. Its ease of access and towering height are not the only reason this is a common attraction. The bottom of the falls splashes into a large observation pool, visible from behind the falls as well. The trail leads you into the cliff face and into a small cavern area. This allows you the unusual chance to look outward from beneath the falling water. Facing west, this view will grant you a spectacular sunset from one of the world’s more unique observation points. The open basin does allow the wind to toss the spray in all directions. For this reason you may get wet. In winter, this path may be inaccessible due to the formation of ice from this effect. In addition to the main fall, other waterfalls in the area make Seljalandsfoss south Iceland’s premier location for many tourists. 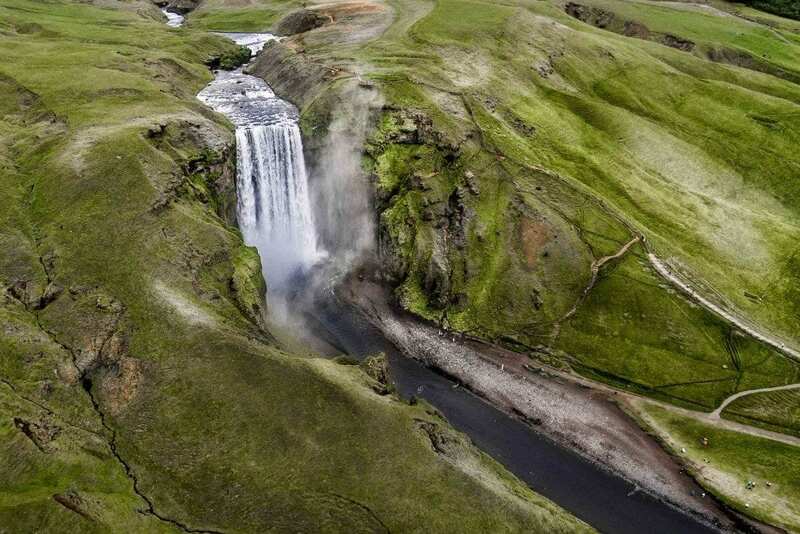 Another powerful water fall along south Iceland’s coast is the magnificent Skógafoss. This fantastic sight is another one of the gems in Iceland’s crown visible from the ring road and thusly highly popular with the crowds. 227 feet in height and an impressive 100 feet across, the spray from this waterfall creates a nearly ever-present rainbow. It is definitely a must-see location. Hiding beneath the misty rainbows is an age-old legend. Upon their first sail into South Iceland, the Vikings discovered Skógafoss. They scuttled one of their treasure chests in the cave behind the falls. Forgotten and abandoned, the treasure was stumbled upon by locals who grasped at the gold ring on the side of the box. The treasure chest disappeared before it could be retrieved but the local men came away with the ring. They presented their find to their church and it was used on the church’s front door. The whereabouts of the treasure is still unknown. However, the ring can be found in the local museum along with other legends of the time. Take the worthwhile hike up into Vatnajokull National Park to Svartifoss. Here, not only will you be rewarded with some wonderful views of the glacier along the way, but you will come across an amazing sight at your destination. Svartifoss may not be south Iceland’s most powerful waterfall but it is certainly one of the more interesting. Descending into the basin you will encounter a rocky terrain jagged with hexagonal debris from the black falls. The river flows over the carved cliff and exposes spectacular black columns underneath. Columnar basalt, exposed by the retreating glacier, decorate this natural amphitheater. They hang tenuously overhead as their bases are worn away. Visitors to the falls are impressed with the stark contrast of the black rocks against the white of the spilling water. In winter the stream’s flow is smaller but the contrast is enhanced by the surrounding snow. 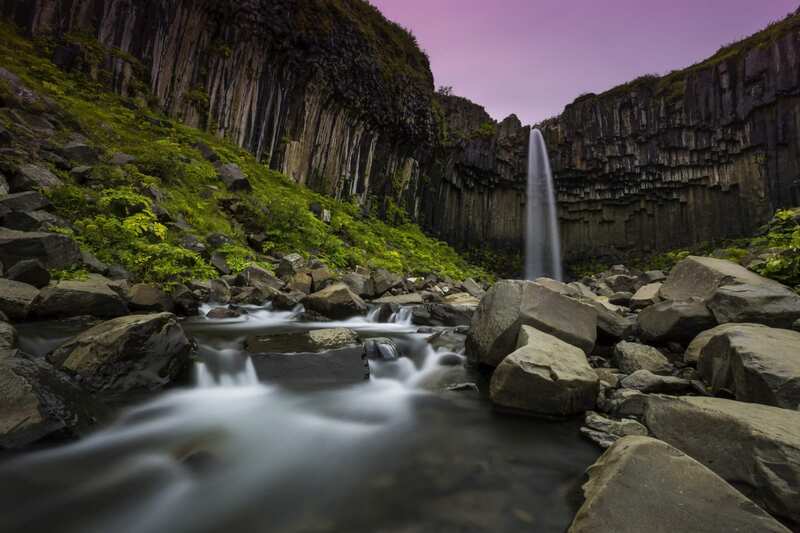 Not as easily accessible as the other falls in south Iceland, this wonder of geology may be worth your trek. Being able to escape and enjoy the beauty among fewer people is second to none. The iconic archway of Dyrhólaey is a sight you won’t soon forget. 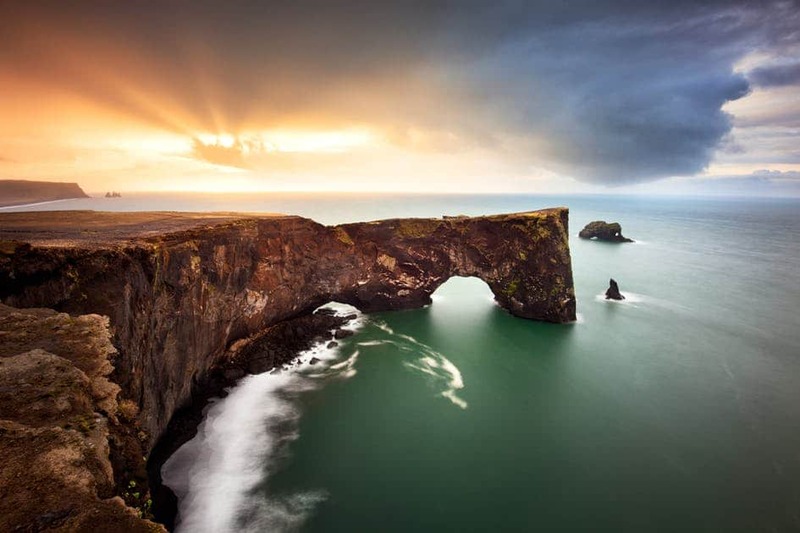 A 120-foot-tall peninsula at the southern tip of Iceland, this natural promontory formation was created by the pounding waves eroding the black volcanic rocks leaving behind the distinctive archway. Facing west on a clear day one can see the entire coastline of south Iceland, nearly back to the western towns. To the north you get a spectacular view of the Mýrdalsjökull ice cap, the glacier covering the Katla volcano. And when you look to the east, you will see the black sand beaches and lava stacks of Reynisdrangar. Walking out to the end of the peninsula offers a great vantage point of the nesting seabirds in the crags and cliffs. Summertime is the best time for this view as access to walking the topside is closed during a few months in late spring protecting the Puffins with some privacy during their mating season. Observations from the Dyrhólaey viewpoint and the connected lighthouse are fantastic, and if you take the walk out to the arch, you’ll never be the same. Just a bit further east from the imposing arches of Dyrholaey is the black sand beach of Reynisfjara. Walking the fine black shore of south Iceland, you will find yourself transported to an alien world. This is one you may recognize from popular film and television. Many film crews flock to this destination for the unusual sights. Towering along the cliffside are impressive pillars of hexagonal basalt that lower into the sea. At the shoreline you can sit atop the shorter columns of these magnificent geologic features and reel in the enormity of those columns rising to the cliffs above you. Off shore are the Reynisdrangar. These are spectacular sea stacks rising from the tumultuous ocean. Investigating these spires are not without their dangers. Many visitors are taken by surprise as rogue “sneaker waves” rush in and douse them with the cold ocean spray. South Iceland police have erected a sign warning visitors to remain vigilant of these waves as they are unpredictable and always dangerous. 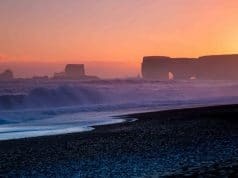 For more on this, please visit our post Visiting Reynisdrangar: A Guide For Tourists in 2018. Another of south Iceland’s famous black beaches is Solheimasandur. Notable among this vast expanse of eerie quiet and desolate landscape is the stark contrast of the black sand against the white remains of a US Navy DC-3 fuselage. In 1973 the simple delivery flight turned tragic when ice buildup prevented the craft from reaching their destination. Pilots and passengers walked away from the emergency belly landing, but the aircraft was abandoned in place and still remains there today. 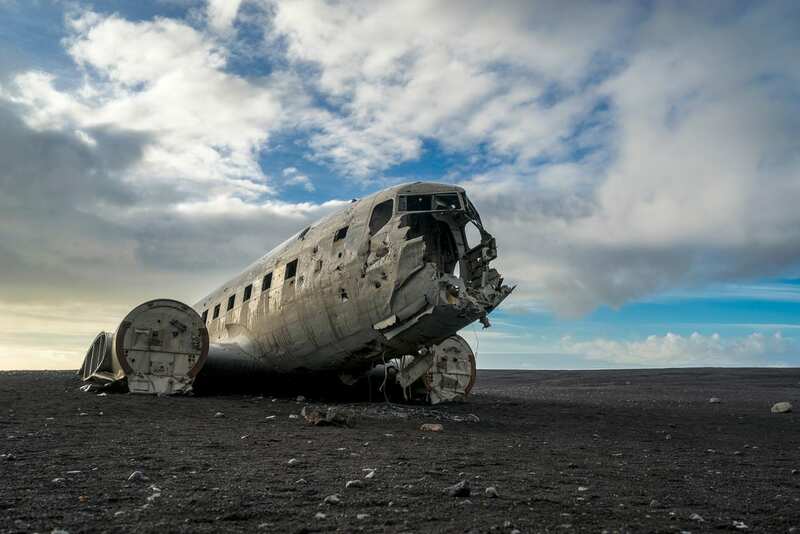 South Iceland authorities have assured that because there were no serious injuries, visiting and touching the craft is fine, but for safety reasons, they advise against climbing on top of the plane. Vehicular traffic to the wreckage has been restricted due to concerns that the influx of traffic to the popular tourist site can cause irreparable harm to the local ecosystem. However, the site remains open for an exhilarating two-mile (one way) hike over the rich black sands. The open expanse clear to the horizon is hauntingly calming and has prompted some travelers to compare the lonely beach to the lunar surface. South Iceland is ringed with the famous black beaches. However, the glacial outwash plane of Breiðamerkursandur gained its new name of Diamond Beach in glorious fashion. 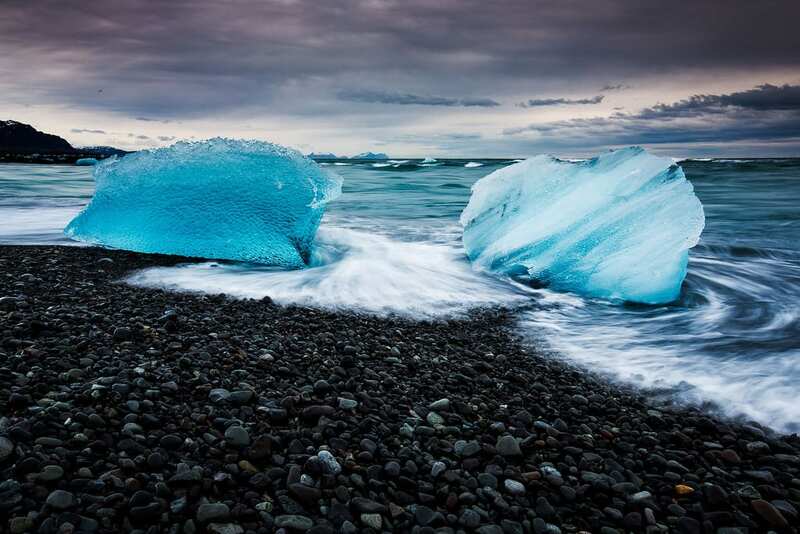 Separating the Jökulsárlón Lagoon from the open sea, Diamond Beach is littered with icebergs of all sizes and shapes stranded by the tides and glittering in the sun making a spectacular display of dazzling lights. Fresh, sharp, jagged ice or worn smooth and rounded ice, crystal clear like glass or shadowy and opaque. You will see a variety of icy gifts deposited from the nearby lagoon waiting on the next tide to carry them out to sea. Because of the tidal nature of this phenomenon, every visit to the site will grant you a new view to witness making Diamond Beach a beautiful location to revisit on your many trips through south Iceland’s bountiful attractions. See the diamonds at dawn, dusk or even perhaps under the northern lights. Be sure to have your camera at the ready, Diamond Beach never disappoints. The inland side of Diamond Beach is the Jökulsárlón lagoon. Situated at the head of the Breiðamerkurjökull glacier and marking the southern edge of Vatnajökull National Park, this lake is continually expanding to glacial retreat. The lagoon came into creation as a proglacial lake in the early 1930’s and is now certified as Iceland’s deepest lake at 814 feet. Breiðamerkurjökull continues to draw away from south Iceland’s coast and the lagoon continues to grow. 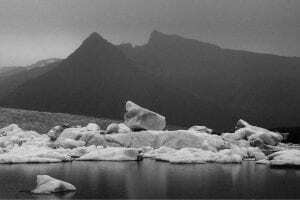 The glacier calves its mighty icebergs into the lagoon and sets a dramatic landscape for you to witness. A ghostly parade of ice slowly drifts toward the sea, bumping and jostling into one another as a reminder of nature’s sheer power. Cruising in and out among these behemoths are varying sized local watercraft. You may see the large LARC-V amphibious vehicles carrying a couple dozen people on a guided tour, or the more adventurous kayakers journeying out for a more personal experience. Once you board your vessel and sail between the icebergs, your memories of south Iceland will never be the same. 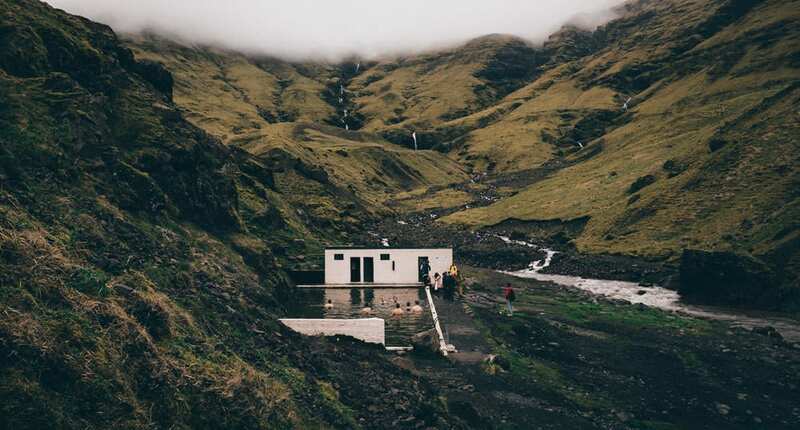 Just a small hike from the road brings you to south Iceland’s oldest geo-thermal pool, Seljavallalaug. Named for the local farm fields, this popular swimming pool was first built in 1923 and served as the location for mandatory swimming lessons. The natural spring-fed pool sits in a picturesque green valley. One side of the pool joins the base of the rising hills. Views while relaxing in the water are unparalleled and are worth the hike past the newer, more popular pools. One can enjoy soaking in the solitude of south Iceland’s beauty. 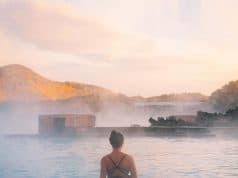 For more on this, please visit our post Iceland Hot Springs: Four Incredible Options. If you enjoy hiking up the trails of Fjadragljufur, across the face of Eldfell on the Westmen Islands, taking in the splendor of south Iceland’s countless waterfalls, walking the black beaches of Solheimasandur and Breiðamerkursandur, sailing amid the icebergs in Jökulsárlón or swimming in Seljavallalaug. Walking alongside volcanoes, holding icebergs in your hands, feeling the spray of a glacial waterfall on your skin. South Iceland has something for everyone and every part of it adds up to an incredible experience. South Iceland offers you the opportunity to experience a small taste of the rugged worlds we have read about in books, seen on our screens in movies and on television. Step out from our mundane world into this amazing world full of new sights and wonder. Witness these incredible experiences first-hand and feel yourself absorb the charm of this unusual natural world. Encounter the sights and sounds, experience all south Iceland has to offer and the memories you build will last a lifetime.